There are six main cranial nerves that innervate the eye and its accessory structures. 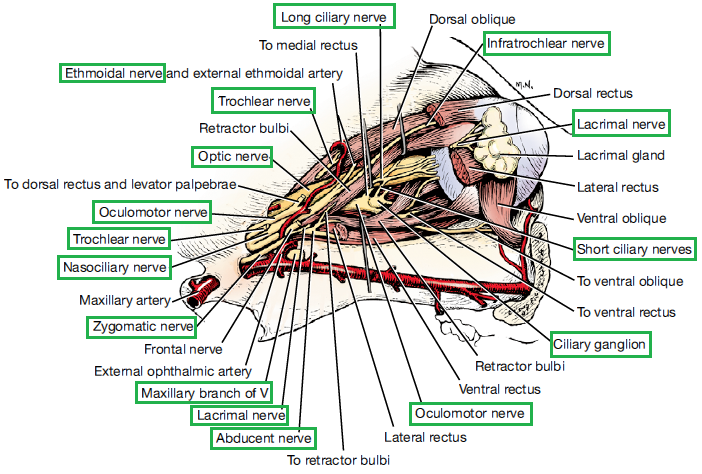 Most of these nerves enter the eye through the orbital cone while others reach the accessory structure directly. Figure 1: Lateral view of the nerves of the eyeball. Nerves are in the green boxes. Source: Evans H.E. and Lahunta A. (2010) Guide to the dissection of the dog, 7th edn., Missouri: Saunders Elsevier. Click HERE to test yourself!!! 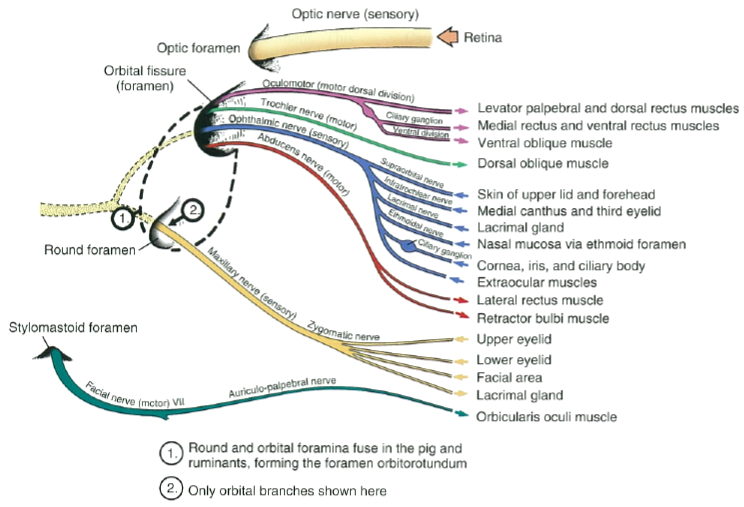 Figure 2: Dorsal view of nerves of the eye displaying oculomotor, trochlear, trigeminal (ophthalmic branch) & abducent nerves. These nerves are in the green boxes. Source: Evans H.E. and Lahunta A. (2012) Miller's anatomy of the dog, 4th edn., Missouri: Saunders Elsevier. Figure 3: Dorsal view of the superficial distribution of nerves in the eye of a dog. 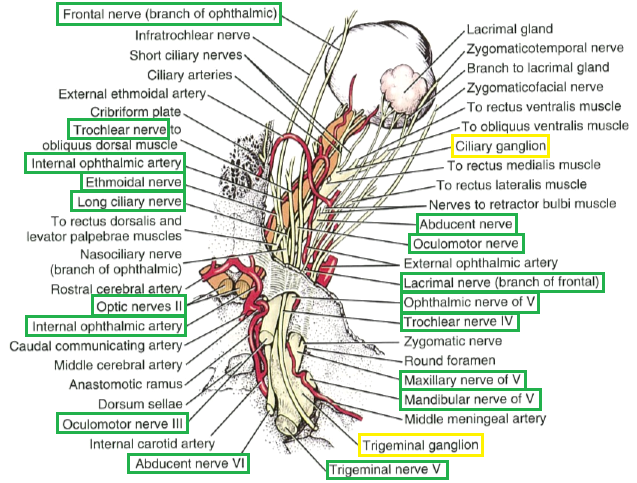 The main nerves are in the green boxes while the those in yellow boxes are ganglions. Figure 4: Cranial nerve supply of the eye. Direction of signal transmission is indicated by arrows. Source: Maggs D.J., Miller P.E. and Ofri R. (2013) Slatter's fundamentals of veterinary ophthalmology, 5th edn., Missouri: Elsevier. 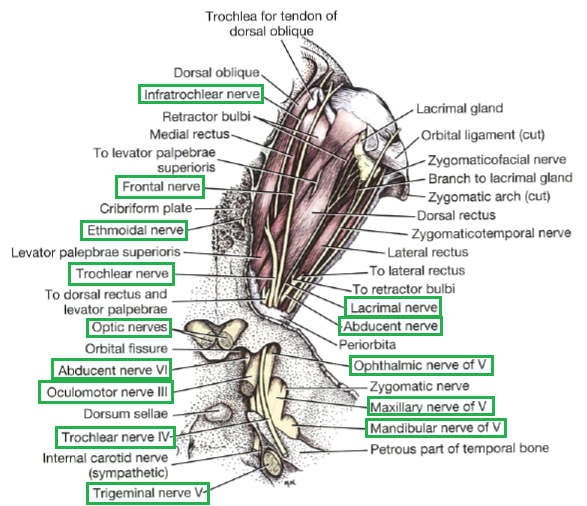 Table 1: Summary of optic nerve, oculomotor nerve and trochlear nerve supply to the eye and adnexa. · Innervate dorsal oblique m.
Dyce K.M., Sack W.O. and Wensing C.J.G. (2010) Textbook of veterinary anatomy, 4th edn., Missouri: Saunders Elsevier. Evans H.E. and Lahunta A. (2012) Miller's anatomy of the dog, 4th edn., Missouri: Saunders Elsevier. Evans H.E. and Lahunta A. (2010) Guide to the dissection of the dog, 7th edn., Missouri: Saunders Elsevier. Gelatt K.N. (2007) Veterinary opthalmology, 4th edn., Oxford: Blackwell Publishing. Maggs D.J., Miller P.E. and Ofri R. (2013) Slatter's fundamentals of veterinary ophthalmology, 5th edn., Missouri: Elsevier.